Are you still worrying about cleaning the floor? 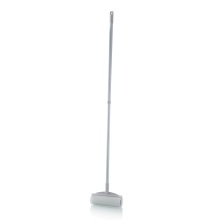 This mop can help you thoroughly clean the wood floor, floor tile, ceramic tile and marble. Sticky roller design, it can easily help you pick up hair, lint crumbs, dust, debris, etc. Widely used in the kitchen, bedroom, living room, housekeeping companies & hotels, etc. And the extendable handle can be easily adjusted to the suitable size to meet your using needs. Super sticky and very practical, helping quickly remove dust, hair or debris from furniture, floors, stairs, rugs, cabinets and more. Extendable handle design, which can be adjusted to the suitable size to meet your using needs. With 60 sheets of sticky papers on the roller, enough for you to use, and it can be torn off and thrown away. Detachable design, easy to clean the mop. Can be used in the kitchen, bedroom, living room, and housekeeping companies & hotels, etc. Very practical and useful, easily helping you finish the cleaning work.